Some things never change such as the need for preventative maintenance, but the “tune-up” is one service that has changed a great deal over the years. There was a time not so long ago that a “tune-up” meant replacing ignition cap, distributor rotor, spark plugs, ignition wires, fuel filter, air filter, adjust the vehicles timing, adjust the fuel mixture and changing the engine oil from summer oil to winter oil or vise versa. However, in todays modern vehicles distributors are now gone, spark plug wires are missing from many applications and the oil no longer needs to be switched from summer to winter (and vise versa). Spark plug replacement can vary drastically between manufacturers. For example, Volkswagen recommends replacing spark plugs at 60,000kms while GMC recommends replacing them at 160,000kms. And those adjustments? 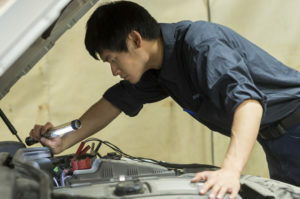 The vehicles onboard computers handle fuel mixture, timing and idle speed controls. road test the vehicle to check for wheel bearing noise, transmission operation, general operation/drivability and speedometer operation. We also research the vehicle manufacturers service recommendations to let you know which services may be due, so you are not caught by surprise. I have full confidence my vehicle will be maintained at its highest level of performance and that any mechanical issues that might arise will be resolved with expert service and in a timely matter.